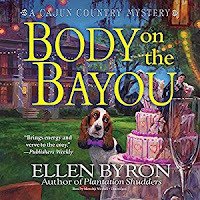 The Crozats feared that past murders at Crozat Plantation B&B might spell the death of their beloved estate, but they've managed to survive the scandal. Now there's a très bigger story in Pelican, Louisiana: the upcoming nuptials between Police Chief Rufus Durand and Vanessa Fleer. I loved the setting of this cozy mystery series! It takes place on an historic Louisiana plantation. The plantation was once owned by the Crozat family, and now it's been turned into a bed and breakfast. The main character, Maggie Crozat, works at the plantation as a tour guide. Her co-worker, Vanessa Fleer, is a pregnant bride-to-be and a bit of a bridezilla. She gives Maggie a lengthy laundry list of to-do items as the maid of honour. Vanessa's fiancé is the local Police Chief, and his family and the Crozat family have a history of bad blood between them. When one of the B&B's guests is found dead in the bayou, Vanessa orders Maggie to find out who the killer is. 4 stars!! It was really good, and you should put it on your TBR list if you enjoy cozy mysteries! You've caught my attention! I may have to check out the series!